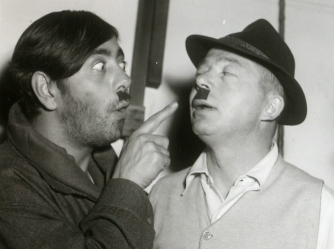 Billy Wilder was an Austrian born filmmaker/writer/director… and all-around cinema genius. Born Samuel Wilder on June 22, 1906 in Sucha, Austria, Wilder went from being a Viennese reporter to a free-lance writer in Berlin where he started working on film scripts in 1929. As Hitler rose to power, Wilder moved to Paris to direct his first film, as he feared his Jewish ancestry would threaten his existence in nazi occupied Germany. 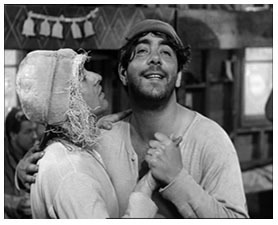 Via his film connections including friend Peter Lorre, he made a new home the United States. 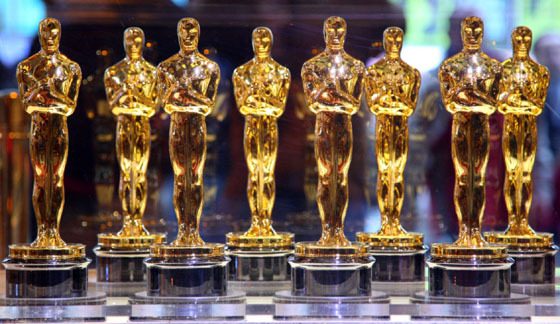 Once in the U.S. he found great success in writing and directing films. 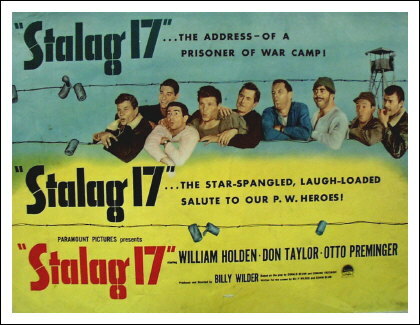 But it became a very personal film for Wilder when he made STALAG 17 (1953). His parents, Berl and Gitla Siedlisker died at the hands of nazis. He discovered that his stepfather had died at a concentration camp in 1942 and his mother was murdered a year later in another concentration camp, Plaszow. Additionally, his grandmother died in 1943 in a Jewish ghetto. While he generally avoided discussing this dark and tragic topic openly, this horrific tragedy no doubt left and imprint on his life. 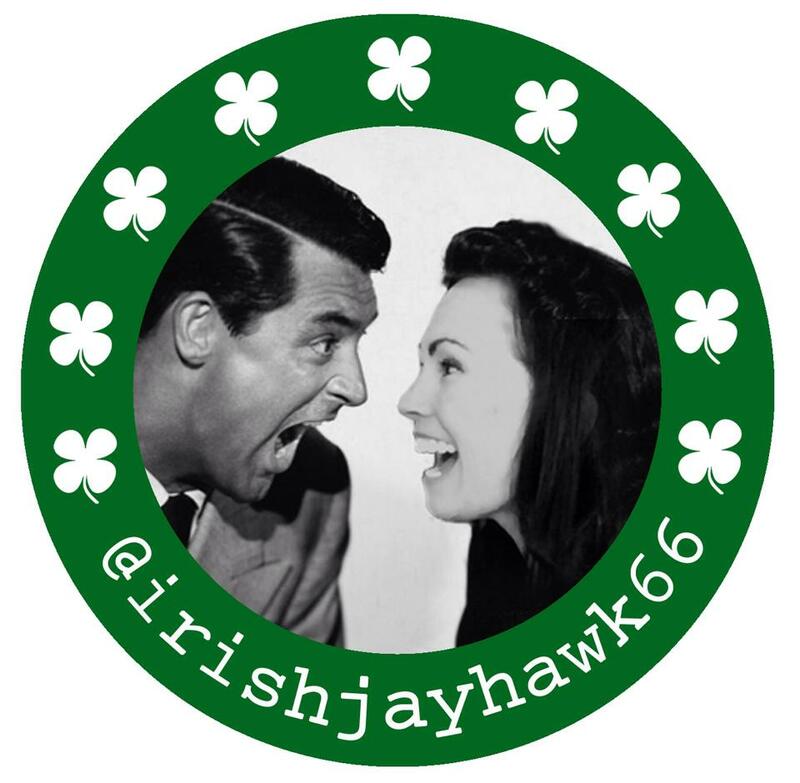 His successes grew with films across the 30’s and 40’s and into the 50’s. But it was during the early 1950’s with films like ACE IN THE HOLE (1951) and STALAG 17, Wilder felt free to take a more cynical, personal cause approach to his filmmaking. 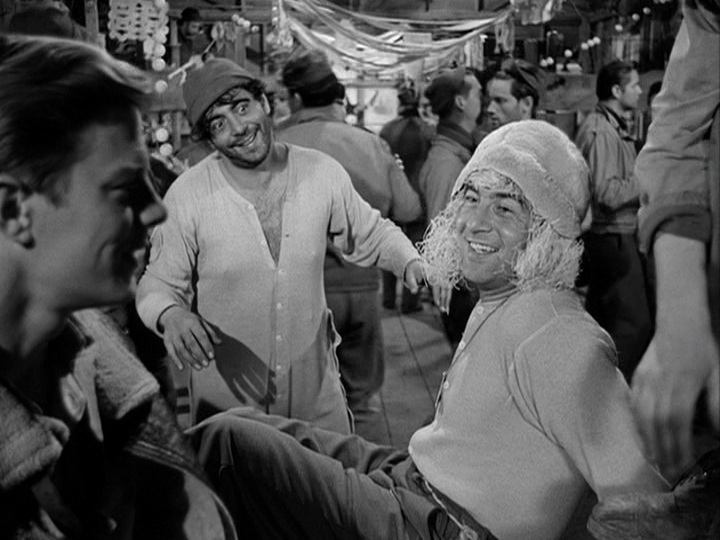 STALAG 17 was originally a play written by Donald Bevan and Edmund Trzcinski which ran on Broadway, as directed by Jose Ferrer, for 472 performances. 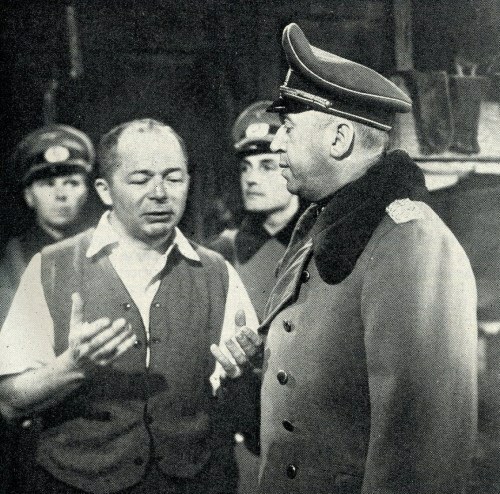 When Wilder took it the big screen, Paramount wanted to downplay the German negativity to avoid offending West Germany audiences, so they suggested making the German officers Polish. Wilder refused. 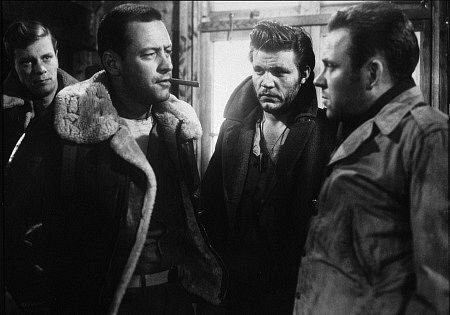 And despite solid profits from STALAG 17 (1953), Paramount felt less generous in sharing to make up for the financial loses from ACE IN THE HOLE (1951), which experienced less than stellar performance at the box office. (A film that was ahead of its time and is much more appreciated today.) Wilder made this his last film with Paramount. The men have planned an escape for two of the prisoners. They all discuss the details of the route inside the barracks: from a secret opening under the stove, over to the latrine, to an underground path to a spot near the fence by the woods nearby. The men show a unified presence to support the escape plan – all but one, Sgt. Sefton. 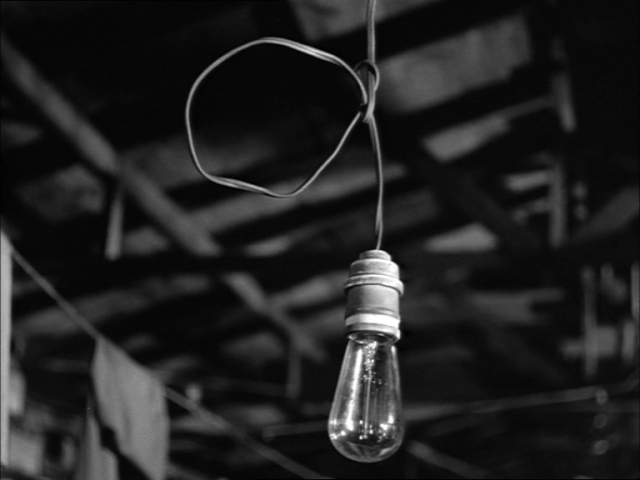 Sefton is a hard-core cynic and the camp’s unapologetic black market profiteer. Instead of a ‘good luck’ send-off, he immediately starts taking bets against the two men making it successfully out of the camp. He’s certain they’ll fail, claiming the odds are not in their favor. Unfortunately, Sefton’s predictions ring true as the entire camp is called to the muddy yard the next morning and the Nazi Commandant displays the two dead bodies in the center for all to see. As punishment, the guards make them fill in the escape tunnel and remove their stove. They can’t figure out how the guards figured out their plan. Two more prisoners are added to this barrack, including an officer, Lt. Dunbar, that reveals to the group how he foiled the nazis via destroying an integral point of transport. Sefton knows Dunbar from his past; when he attempted but failed to make officer level. He makes verbal jabs at Dunbar for being a spoiled little rich boy who he suggests bought his way in to being an officer. At mail call, a prisoner on crutches with a missing leg is able to smuggle in a radio. They briefly listen to details of the troop movements, before guards approach and they hide the radio. Shapiro: Hey Schultz, sprechen Sie Deutsches? Shapiro: Then droppen Sie dead! Sgt. Schulz: How do you expect to win the war with an army of clowns? Lt. James Skylar Dunbar: We sort of hope you’d laugh yourselves to death. Their secrets, including the radio and Lt. Dunbar’s recent maneuvers against the nazis continue to find their way into the guards’ knowledge. Dunbar has been taken by Nazi guards and is being tortured to reveal more details. At this point, they know someone from inside the barracks must be a mole betraying them. The tension in the barracks are growing thick. From Sefton’s cynical attitude and his ability trade favors, they assume he must be the betrayer and all the men band together to beat him. Sefton maintains his innocence, keeping a low profile. 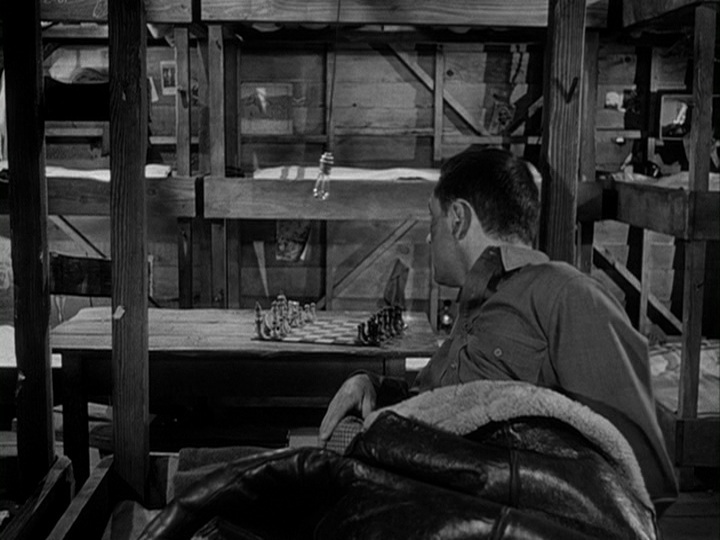 But soon, during a Christmas celebration that is interrupted by an air raid, the mole slips up as Sefton stays behind and hidden when the real traitor makes his contact with Schulz, revealing how he exchanges information- via a lightbulb and the chess set pieces. Now that Sefton knows the enemy’s identity within the barracks, it’s not long before he finds an opportunity to reveal his true colors. It’s also the ideal time to show his own true character, as maybe not as much of a bad guy as all had thought, by helping Dunbar escape himself. It’s in signature Billy Wilder fashion to tackle a subject like this, one so dark in reality (one that also must have been such a personal journey), and with complicated characters that are not so ‘black and white’ in morality. But then he twists it so it’s funny and entertaining with his witty dialogue and characters that draw us in because they often surprise us in the end. He takes an anti-hero like Sefton and turns him into the most brave and honorable character by the film’s conclusion, despite himself. He adds flavoring of characters like Shapiro and “Animal” who deliver the funniest moments throughout with their chemistry and friendship, Animal’s obsession with Betty Grable, and some profoundly real moments too. In example when Shapiro brags that his multiple letters received are love letters as a result of being so popular with the ladies, yet it turns out the letters are repeated overdue bill notices of his Plymouth being repossessed. And in another ‘harsh reality meets dark humor’ moment, another POW reads his wife’s letter in which she reveals how a baby just showed up at their door and she chose to keep it- a baby that astonishingly possesses ‘her eyes and her mouth.’ He tells himself and his fellow bunkmate he believes it. Later on we see him speaking out loud, repeating that, “I believe it” as he tries to convince himself and wrestles with, struggling to see if this is something he can live with. These are all heartfelt touch points that Wilder shares with us in his own, and very brilliant way. 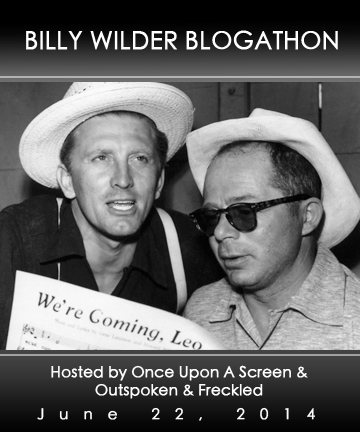 This review of STALAG 17 (1953) is my birthday tribute to Billy Wilder who was born 108 years ago today. 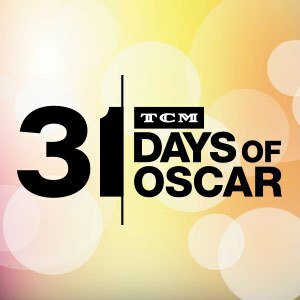 It is shared with other brilliant Wilder films in the BILLY WILDER BOGATHON that Aurora of ONCE UPON A SCREEN and yours truly are hosting today. Here is the full list of participants.